Mercedes C-Class Coupe reviewed | What Car? A sleeker, three-door version of the recently revamped C-Class saloon. This is Mercedes answer to the Audi A5 and BMW 3 Series Coupe. In all, for a car that starts at more than 30,000, rather disappointing. All C-Class Coupes come in AMG Sport Edition 125 trim, with suspension thats stiffened and lowered compared with an equivalent SE or Elegance saloon. It treads a fine line between comfort and sportiness, and not always successfully. Body control is strong. This, and plentiful grip, mean the C-Class Coupe handles well. The ride is fidgety, though. Curiously, its more of an issue at motorway speed, where it never really settles. 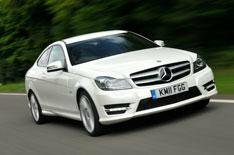 Unlike most Mercedes, the C-Class Coupe isnt a particularly relaxed cruiser. The steering isnt entirely satisfying, either. It reacts quickly enough and demands little effort, but it has a light, insubstantial feel thats at odds with the cars sporty character and trim. We drove a 350 CGI Blue Efficiency, which has a 302bhp, 3.5-litre V6 petrol engine. Theres plenty of pace, but you need to be prepared to work it fairly hard, because peak power and torque dont arrive until 6500rpm and 3500rpm respectively. The standard seven-speed automatic gearbox can be reticent at times, too, but you can overcome this by using the manual shift paddles behind the steering wheel. Refinement is generally good. Its a shame the engine doesnt sound more characterful sound, though, and that the stop-start system sometimes makes an unseemly noise as it kicks the engine back into life when you pull away. Much like a C-Class saloon, which is both a good and a bad thing. The updated C-Classs cabin is much better than the previous cars; its solidly built and mostly classy. Bar bespoke seats and upgraded trim, though, theres little to distinguish the Coupes cabin from that of an entry-level C-Class saloon. Its good enough, but doesnt feel particularly special. Up front, theres lots of head- and legroom. The rear seats are usable, if not massively comfortable for adults, and headroom is rather tight. The boot is large and well shaped. Prices are around 1600 higher than for the equivalent saloon, but AMG Sport Edition 125 trim includes sat-nav. The C180 Blue Efficiency version kicks things off at 30,720, while the 38,140 C350 Blue Efficiency sits at the top end of the range. Our test car included around 11,000 of options, taking it to nearly 50,000. For that kind of money, the C-Class Coupe just doesnt feel special enough. Cheaper models make more sense, but we cant help thinking youd be better off with either a BMW 3 Series Coupe or Mercedes own E-Class Coupe, which is larger, arguably more desirable and, model-for-model, costs only around 2000 more.